The human brain, with its 100 billion neurons that control every thought, word, and action, is the most complex and delicate organ in the body. Because it needs extra protection from toxins and other harmful substances, the blood vessels that supply the brain with oxygen and nutrients are highly selective about which molecules can cross from the blood into the brain and vice versa. These blood vessels and their unique network of supporting pericyte and astrocyte cells comprise the blood-brain barrier (BBB). Figuring out exactly how the cells of the BBB and the brain influence each other has been a major challenge in neuroscience. Now, researchers at the Wyss Institute for Biologically Inspired Engineering have created a “just right” model of the BBB-brain interface using microfluidically linked Organ Chips that allow an unprecedented look into how the brain’s vasculature influences and regulates its metabolic function. The research is reported in Nature Biotechnology. “Most of today’s research on Organ Chips is focused on trying to increase the complexity of cell types on each chip, but we realized that the brain is already so complex that we couldn’t analyze it on one chip, so we did the opposite and divided one organ onto multiple chips,” said first author Ben Maoz, Ph.D., a former Technology Development Fellow at the Wyss Institute who is currently an Assistant Professor at Tel Aviv University, Israel. Joining Maoz as co-first authors of the paper are former Wyss Institute colleagues Anna Herland, Ph.D., who is now an Associate Professor at the Royal Institute of Technology and the Karolinska Institute in Stockholm, Sweden; and Edward FitzGerald, Ph.D., currently an Industrial Marie Skłodowska-Curie Fellow at Beactica AB and Uppsala University, Uppsala, Sweden. The BBB-Brain Chip system consists of three chips: one “influx” BBB Chip, a Brain Chip, and a second “efflux” BBB Chip, all connected with microfluidic channels to allow the exchange of chemicals and other substances between them. The BBB Chip has one channel lined with endothelial blood vessel cells separated by a porous membrane from a parallel channel containing supportive pericytes and astrocytes in cerebrospinal fluid. 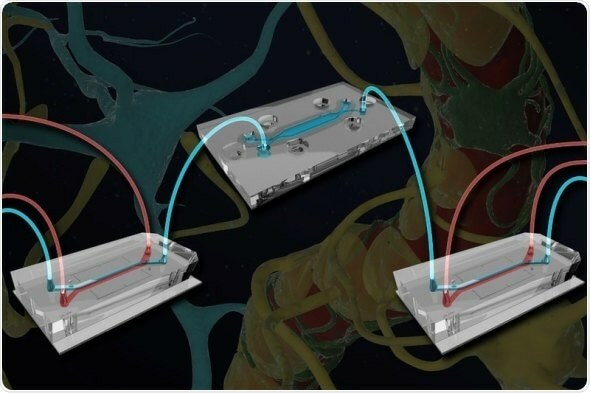 The Brain Chip has similar parallel channels that are separated by a semipermeable membrane, one of which contains human brain neurons and their supporting astrocytes to mimic brain tissue. The three chips’ channels are connected together in series, creating a fully linked system in which substances can diffuse from the first BBB chip’s vascular channel into its cerebrospinal channel, enter the Brain Chip’s neuronal cell compartment, flow back into the cerebrospinal channel, and ultimately diffuse out into the second BBB Chip’s vascular channel, as happens in vivo. The team cultured human cells in the linked BBB-Brain Chips and exposed them to methamphetamine, which is known to disrupt the junctions between the cells of the BBB in vivo and cause it to “leak.” When meth was flowed through the blood vessel channel of the BBB Chip, it compromised the junctions of the BBB’s vascular endothelial cells and allowed the passage of molecules that normally wouldn’t be able to cross the BBB into the Brain Chip. This experiment confirmed that the model worked, and established that it could be used in research to better understand drugs’ effects on the human brain and develop treatments. The scientists also discovered that the proteins expressed by the cells on linked BBB and Brain Chips were different from those expressed by cells on unlinked chips. For example, cells in all of the linked chips expressed higher levels of metabolism-associated proteins and lower levels of proteins involved in proliferation and migration than cells in unlinked chips, suggesting that the BBB and the brain do in fact help each other maintain proper function. radioactive carbon-labeled glucose, pyruvate, or lactate as an energy supply to decoupled Brain Chips, and found that the production of both glutamine and the neurotransmitter GABA was lower in unlinked Brain Chips than in Brain Chips linked to the BBB. Intriguingly, this finding demonstrated that products of vascular endothelial cell metabolism become substrates for the production of neurotransmitters by neurons, suggesting that the health of our blood vessels could have a direct impact on mind function.